Who says you can’t go home again (especially if you’ve been winning)? On Tuesday morning, UFC president Dana White announced via Twitter that they have brought back Anthony “Rumble” Johnson (pictured). White will throw Johnson right into the fire, as the now-light heavyweight meets Phil Davis on April 26 at UFC 172. White fired Johnson in January 2012 following a submission loss to Vitor Belfort – or more importantly, for missing weight for the third time (two at welterweight and one at middleweight) in 11 UFC fights. The 29-year-old has been on a torrid tear since his UFC release, winning all six of his scraps in smaller organizations. Johnson hit the free agent market last month after knocking out Mike Kyle at World Series of Fighting 8. 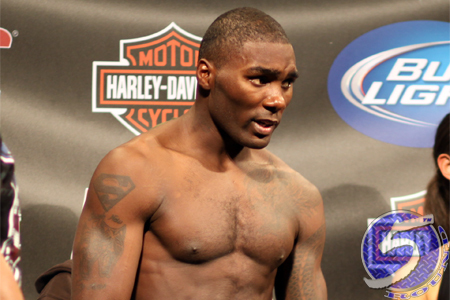 “Rumble” owns a 16-4 professional record and posted a 7-4 mark under the UFC’s watch. Davis, meanwhile, has been waiting (somewhat) patiently for his next assignment. Despite being healthy, the wrestler hasn’t been seen since taking a highly controversial unanimous decision victory over Lyoto Machida at UFC 163 in August. “Mr. Wonderful” is perfect through his past three scraps. Baltimore Arena in Baltimore, Maryland hosts the festivities.